Lighting My Friend’s Place allows our team at Images by Lighting to be part of a wonderful charity organization that provides vital services to more than 1,400 homeless youth in Los Angeles. 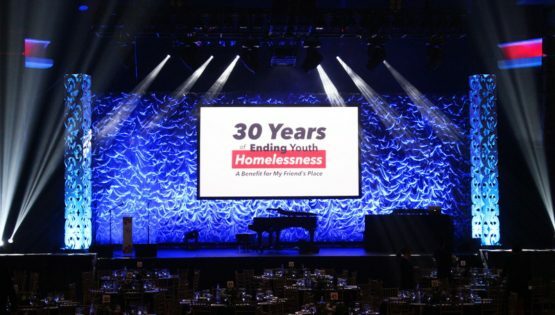 To commemorate its three decades, the organization held a charity event — the 30th Anniversary Gala at The Hollywood Palladium — which was hosted by actor and comedian Jack Black. 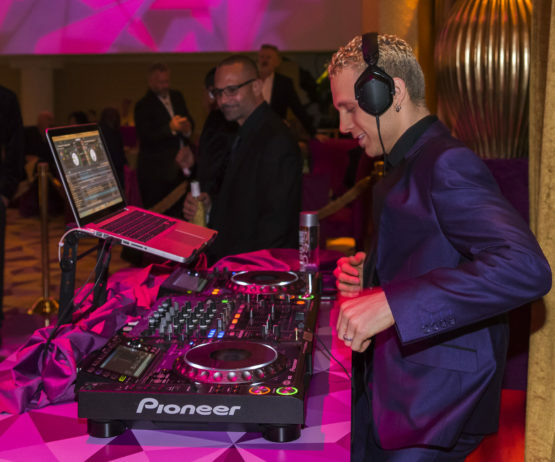 More than 500 philanthropic leaders and homeless youth advocates came together for an evening of entertainment, dining and auctions. 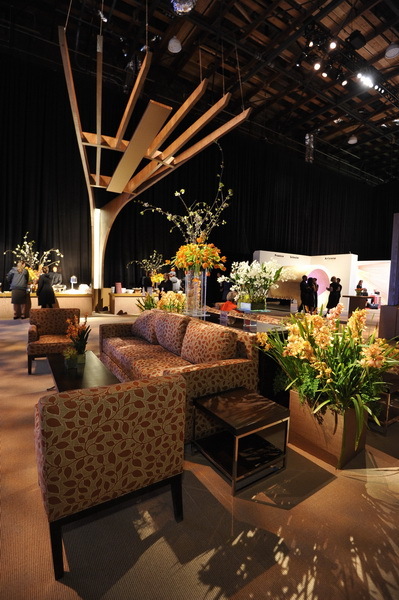 The design theme of the gala was rich floral textures and blooms. Led by Curt Stahl, our lighting team not only created stage lighting that complemented this theme, but also created different moods as various speakers and entertainers took the stage. The laser-like beams in red, blue and yellow stage lighting highlighted the rich floral textures throughout the evening. 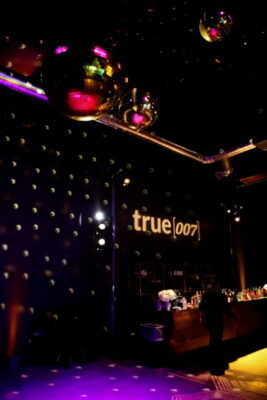 Started 16 years ago by Hollywood insiders as a casual party between friends, the event has grown to 1,200 attendees. 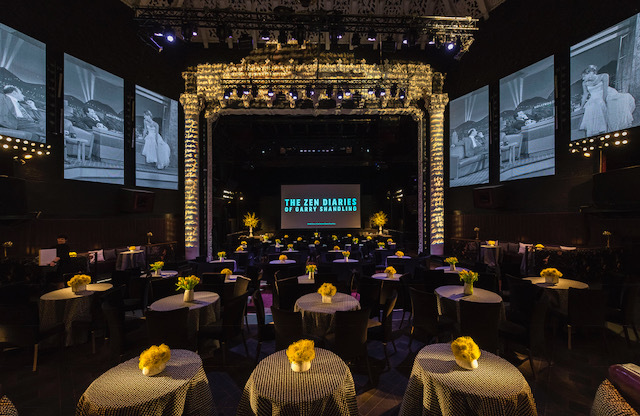 It’s a way for industry insiders to come together casually, to celebrate the industry and the Oscars, and to raise money for MPTF (Motion Picture Relief Fund), a cause that has helped thousands of industry members in need since 1921. This year the event was held at a soundstage at Fox Studios. 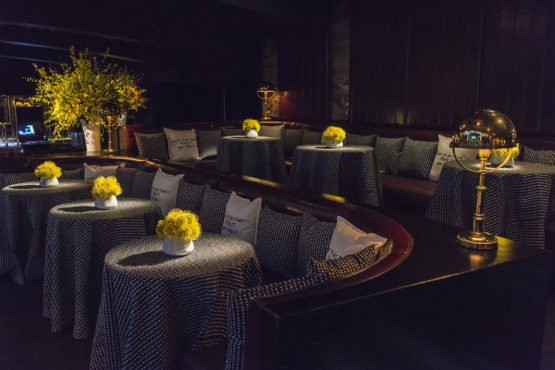 The vision was a simple, yet architectural space in which the guests could enjoy one another’s company, dine on a menu by Caramelized Productions, and experience goods and services from a number of presenting sponsors. 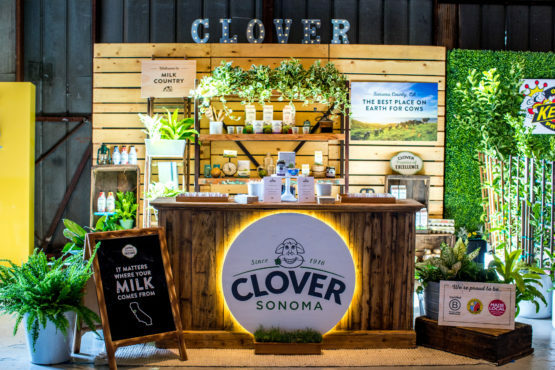 This year there were 11 ranging from transportation to lifestyle goods. The sponsors help raise funds for MPTF and also raise the level of fun and excitement at the event. For instance, Ford gave away a Mustang, and guests could win trips on Delta Air Lines. 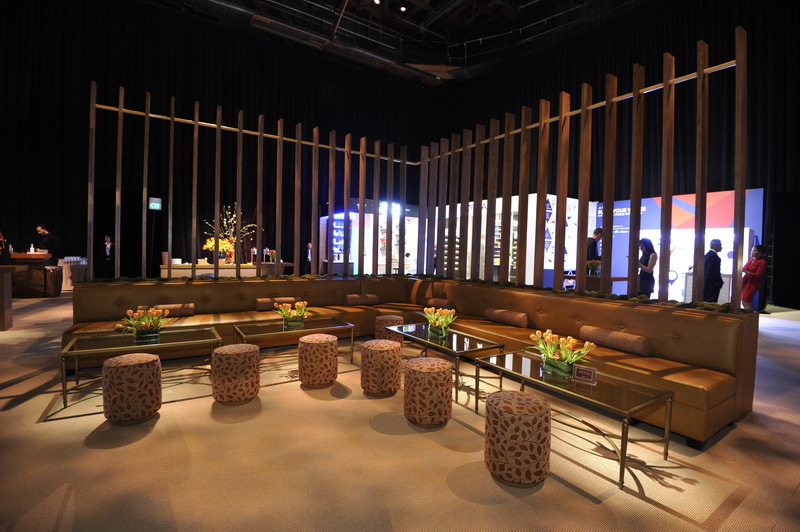 The soundstage was set up with the sponsor booths arranged on the perimeter of the space. 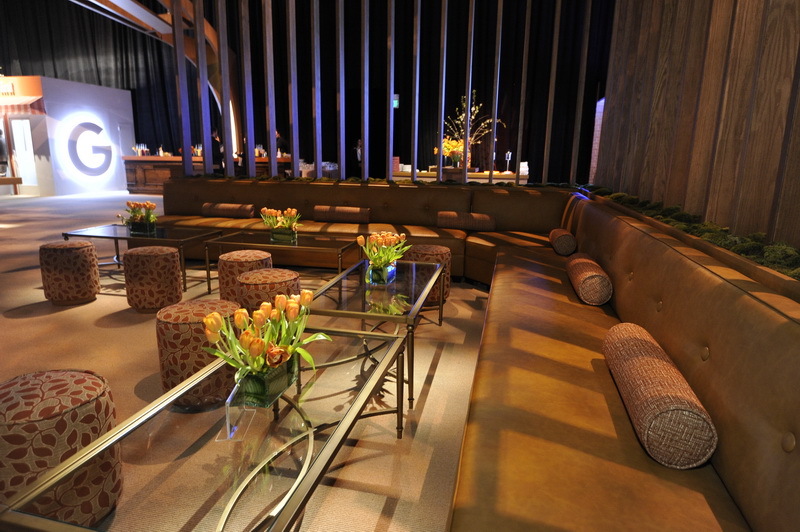 These booths were also constructed by Silver Birches and lighted by Ray Thompson from Images by Lighting. Here, specific lighting needs of each sponsor were taken into consideration such as finding just the right amber lighting for the Ford Mustang on display. 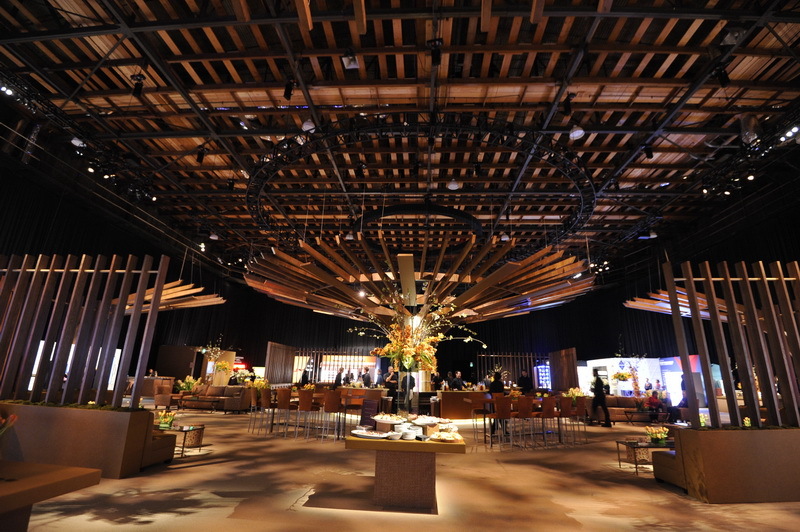 Overall, the space was centered by a large wooden “chandelier” flanked by two smaller ones. 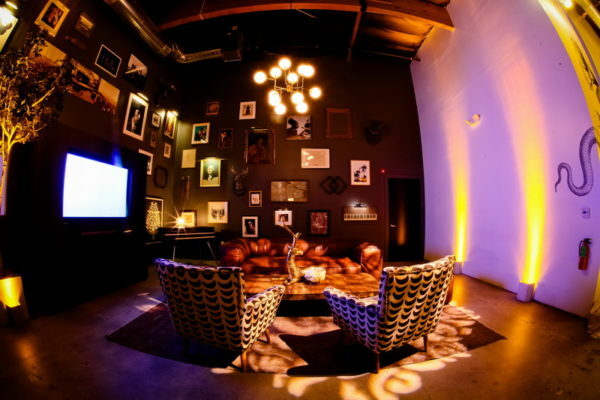 This brought the high, open ceiling of the soundstage down to a more intimate level. 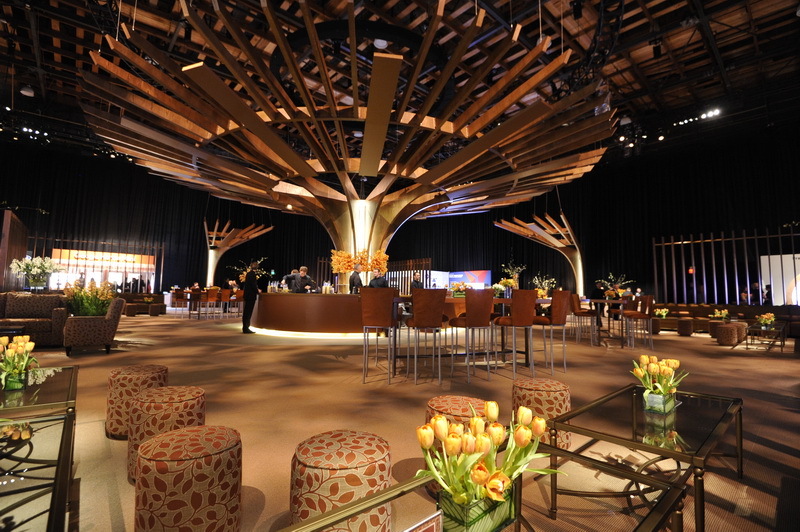 A symmetrical sculptural treatment of the same wood was used in the seating area, further closing the gap between the event space and open ceiling. The lighting was designed with extensive energy-saving LEDs to shine on and through the wooden structure creating more design texture with artistic shadow play. 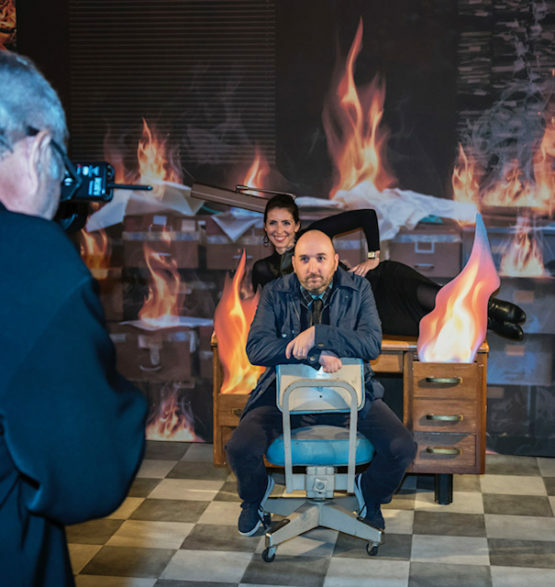 The overall effect of the team’s efforts was a space that was gracious, comfortable and relaxing … all elements that one would want the night before a big day of lights, camera, action, and awards. 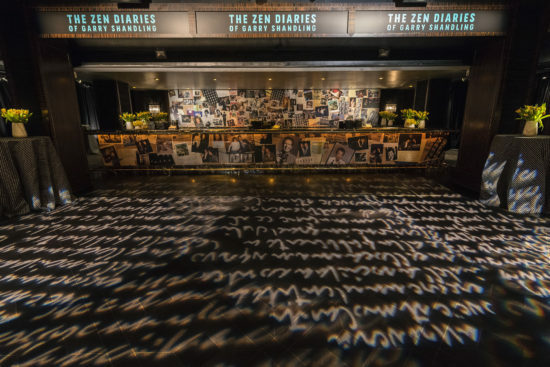 The HBO premiere of The Zen Diaries of Garry Shandling was about words — the funny words Shandling said as his alter-ego, the satirical talk show host Larry Sanders, the private words he used in his journals and the many, many words of admiration from other comedians he inspired and supported throughout his life. 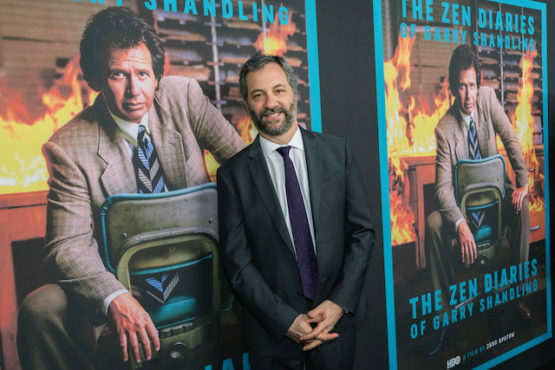 All these words became a film by Judd Apatow who culled them as he was preparing the memorial for Shandling. The documentary will be aired in two parts on HBO March 26 and 27. 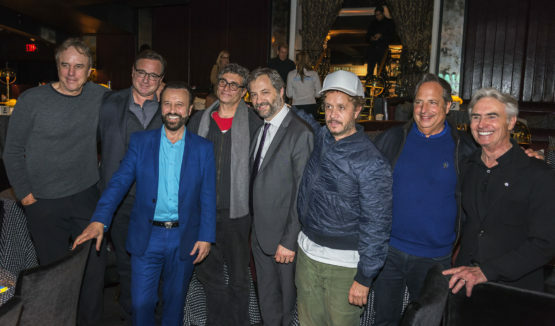 The premiere event paid homage to the documentary, the man and his words. Designer Billy Billy Butchkavitz created a strong design silhouette with linens in black and white emboldened with characters. Pops of color from bright yellow flowers, and even more colorful language (Shandling’s favorite type of words) were printed on pillows. Our lighting designer, Curt Stahl, also used custom gobo projections of words at the entrance and along the proscenium of The Avalon. Rentals by Town and Country and Event Rentals and Photos by Gabor Ekecs. In planning meetings we always ask – what’s the objective? 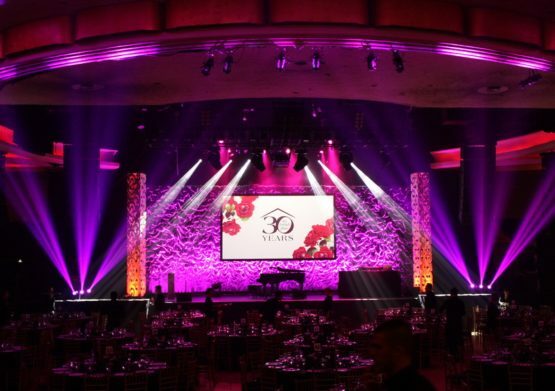 It’s not often that the answer is “To get people to look up.” Usually when it comes to lighting, people want the tabletops to pop, the stage to be well lighted and sometimes some gorgeous gobos to add texture. 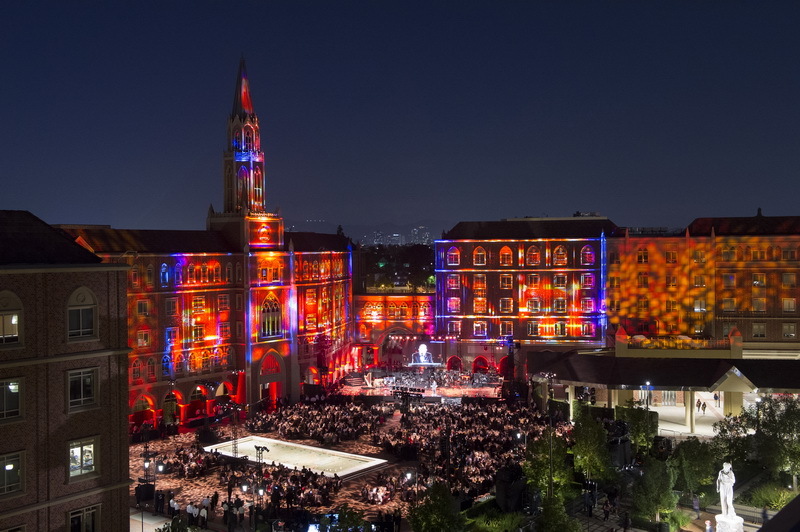 In this meeting, and many more to come, our lighting designer, Curt Stahl, found that the team at the University of Southern California wanted all that AND they wanted people to look up to notice the buildings that would be surrounding them at a courtyard sit-down dinner. The reason? 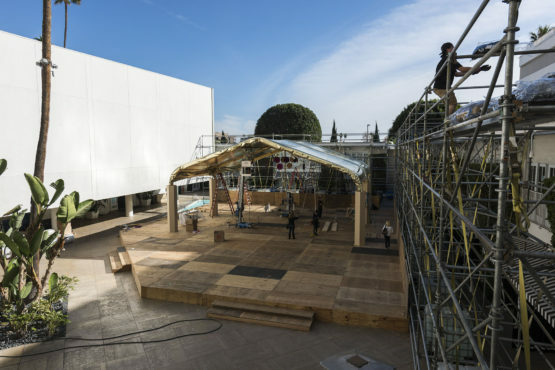 The buildings are part of The Village, a two-year, $700-million-dollar project that involved students, faculty and donors at the university and the entire city of Los Angeles in the making of it. The event was actually the third event in a matter of weeks. 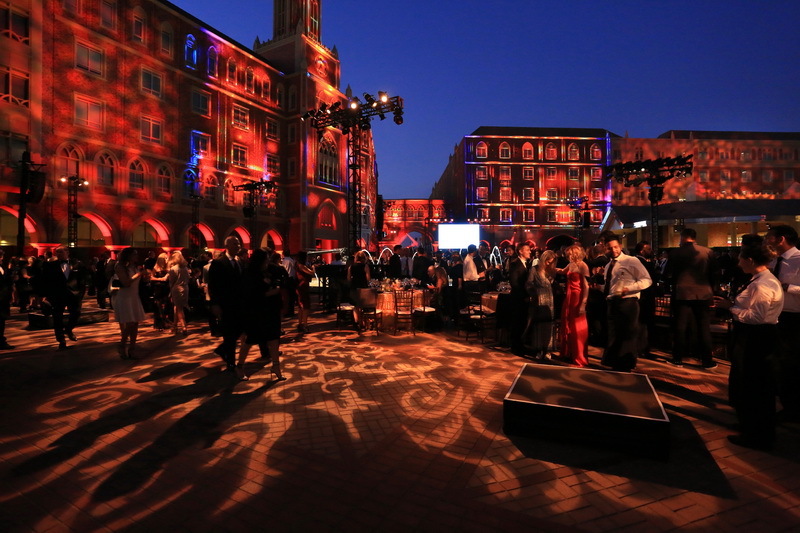 While the others were big in numbers – 15,000 and 2,500 — the Gala was big in scope, intent and audience. 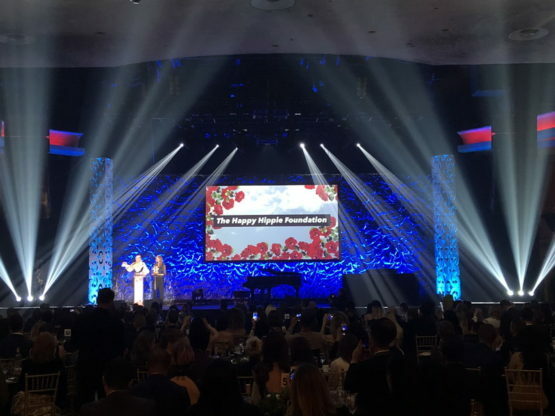 Among the nearly 1,000 guests would be the mayor of Los Angeles, the city’s most prominent business leaders, philanthropists and elected officials. They would be joining USC President C. L. Max Nikias and colleagues for an event that would make them connect with and remember this milestone moment. But that, Stahl would learn, was just the beginning to what would become a monumental evening of light and emotion. The main focus of the show would be to get the guests to see The Village in a way that would make them remember it forever. They would literally see the dream come to life on the walls of the buildings. When the song, Make Our Garden Grow by Leonard Bernstein was suggested to the planning team by the university president, they knew just how to capitalize on it. “We loved the song, and wanted to really make that garden grow,” Rosen said. 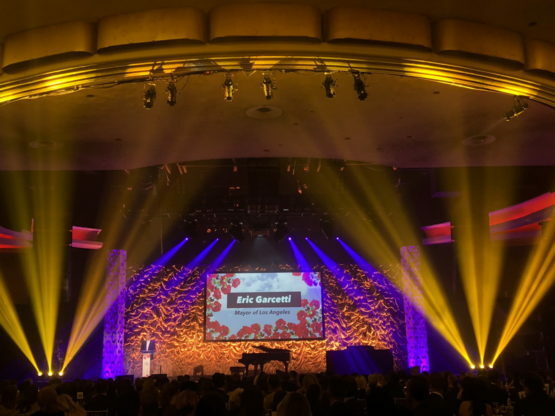 He and Caroline Lett, Senior Event Producer, were very familiar with video mapping and realized that technology like this would be an emotional and artistic way to intertwine the message of heart, soul and progress. 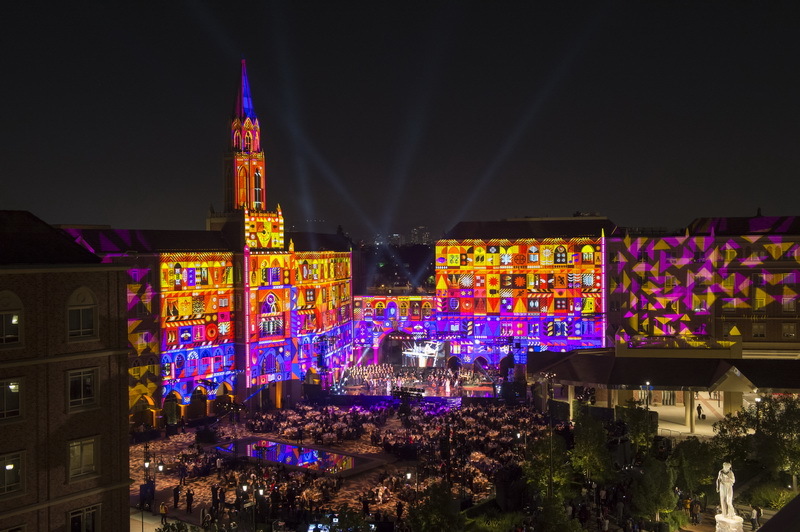 They approached Bart Kresa, from Bart Kresa Design, a creative force in the world of video mapping who began working on the project eight months from the event. Rosen and Lett brought him together with Mike Paterson and Candice Reckinger from the USC School of Cinematic Arts to work out the visual details. Meanwhile, our team led by Stahl began laying all the power distribution for the event from the kitchen power to the lighting to the video mapping. 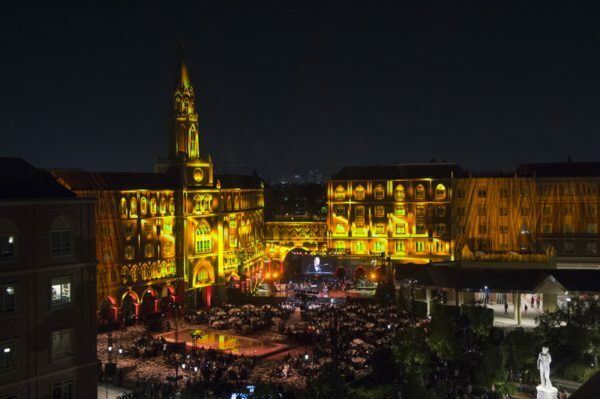 And because Kresa needed to map the projection area of the buildings over 10 days and 10 nights, power was needed 24/7 to run his 28 projectors of 31K each and 11 smaller projectors. 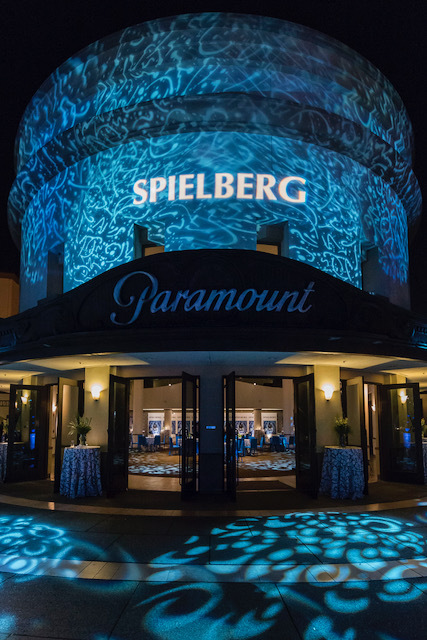 Our involvement grew to include architectural lighting designed to seamlessly integrate with the video mapping which began 20 feet off the ground and was focused mainly on the central building. This left the arches and the far left and right facades to be lit in such a way that guests couldn’t tell where mapping began and our lighting left off. The final element that required lighting was a flash mob performance of 110 dancers and singers from the USC School of Dramatic Arts. One group of performers surprised the group by transforming from waiters into dancers. Moments later another group dressed in aprons from Trader Joe’s (a major tenant) came onto the “stage” from another entrance. And so it continued until the courtyard was filled with a variety of performers, each representing a cultural or academic group from the university or from The Village, who started the evening on an energetic note. Multiple rehearsals enabled our lighting team to know where each performance would go amid the tables so we could follow them with spotlights. Each time another group of performers entered the scene the lighting focused on them. The key was to perfectly time their entrance with the lighting, “telling” the audience where to look and when. 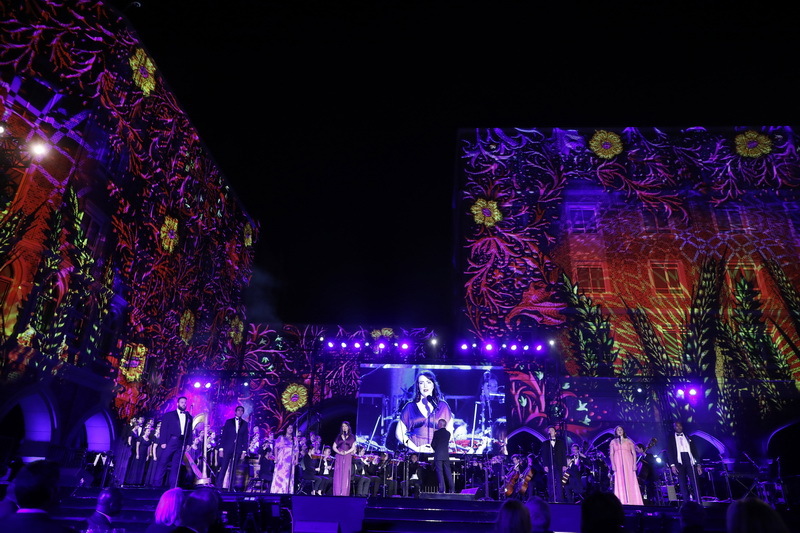 Finally, all performers met on the main stage which we had designed with lighting that would shift throughout the rest of the program for speeches, musical performances and dinner. … UNTIL EVERYONE HAS TO LOOK UP! 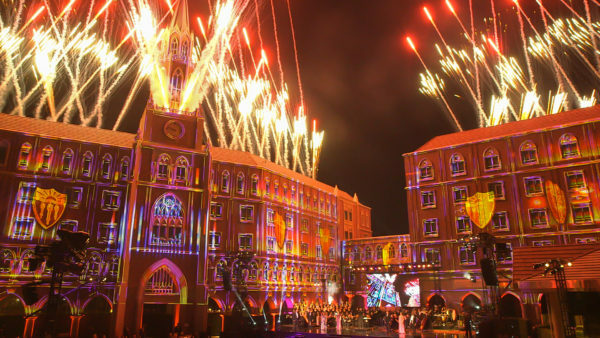 Later in the program, the audience was focused right where the organizers wanted it – up and on the buildings for a gorgeous performance of video technology that mixed with emotion and music. When the fireworks went off at the crescendo, there was not a dry eye in the seats, or from those standing outside the courtyard. Did we mention the students who watched the event as well? Student housing is a big component of The Village and many were already living there at the time of the event which meant that communications between the event organizers and the students was huge. That called for blackout curtains during nighttime rehearsals and total communication the day of the show so no one would open a window or wave just at the moment a video poppy was growing up the wall. In the end, the event was not only a watershed moment for USC, and the city of Los Angeles, but an electrical storm shedding light and energy on The Village for years to come. What better way to make a garden grow? 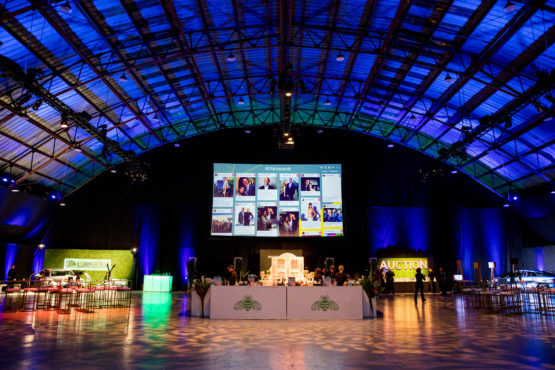 What makes great event design? 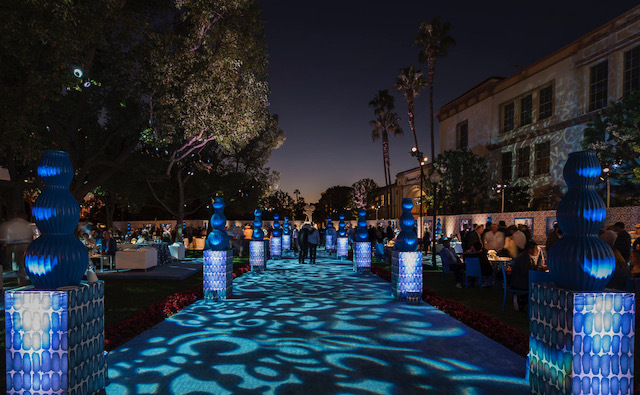 “If you want drama and wow, it’s lighting every time,” says designer Rose Forbes, owner of Two Tree Events in Los Angeles. 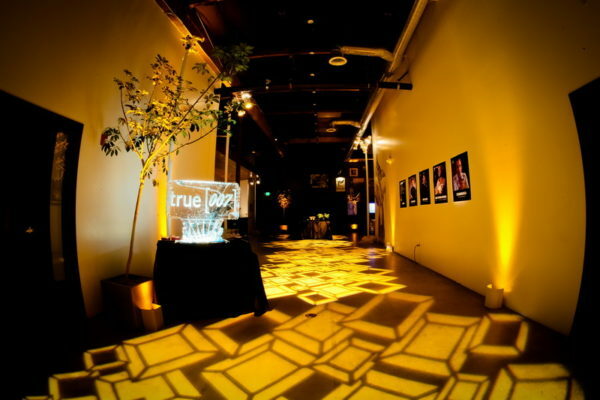 In fact, a holiday event Forbes produced this past season for True[X], a digital ad company, was particularly bonded with lighting. It doesn’t take an international person of mystery to sleuth out that lighting design was a large component of this classic James Bond murder mystery theme! Playa Studios was a blank canvas for the theme to play out. Gold was the primary color while diamonds were the shape that was repeated throughout. 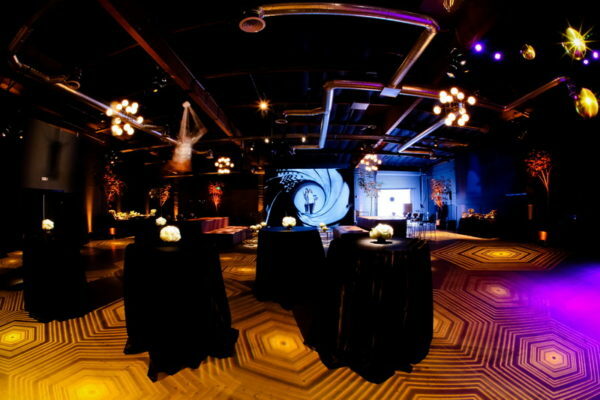 A photo booth area with a Bond shutter effect, a Bond villain and a Bond girl all added to the festivities. 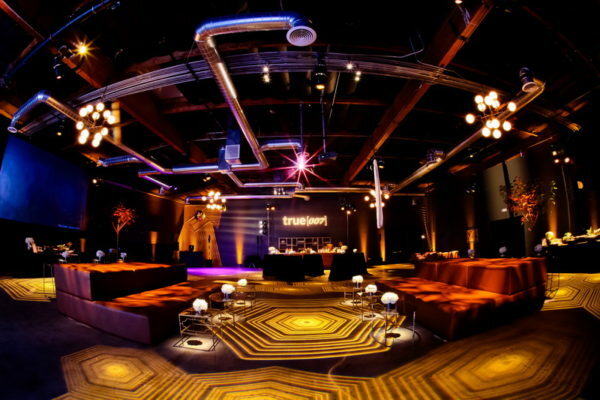 And the perfect accessory for this event – besides a tuxedo and martini – was the addition of one last lighting effect — golden mirrored balls over the dance floor! 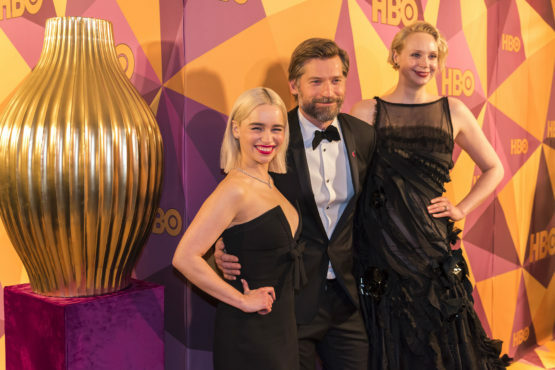 The stars aligned both on the red carpet and for event designer Billy Butchkavitz at this year’s HBO Golden Globes after party at the Beverly Hilton. 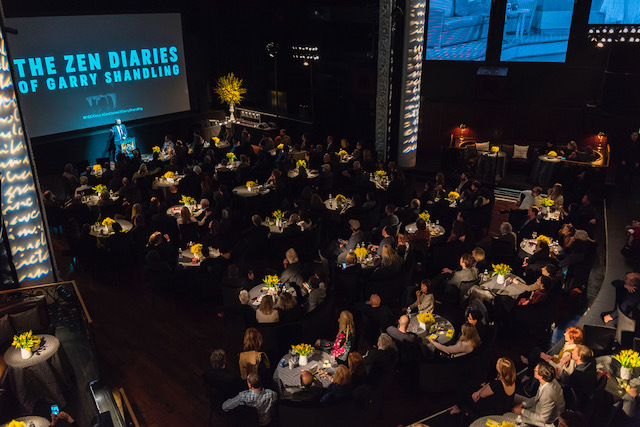 This was the 75th Anniversary of the awards, a milestone marked by diamonds. 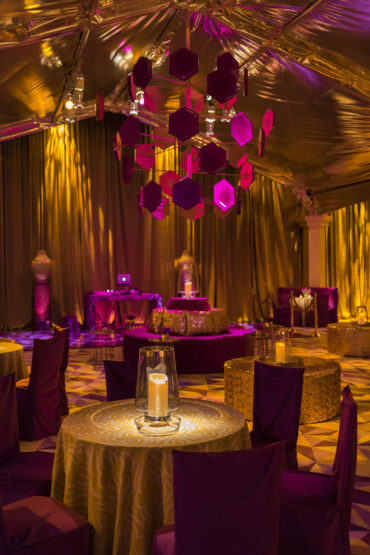 Fusing the facets of diamonds with rich golden tones, accented with orchid, was the perfect visual Billy chose on a night all about Hollywood glitz and glam. 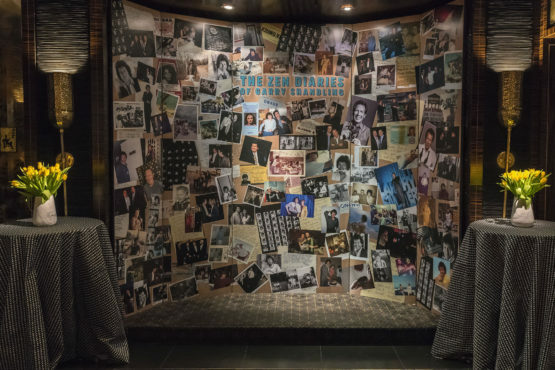 Our LD Curt Stahl worked with Billy to shine light on this multi-faceted design. 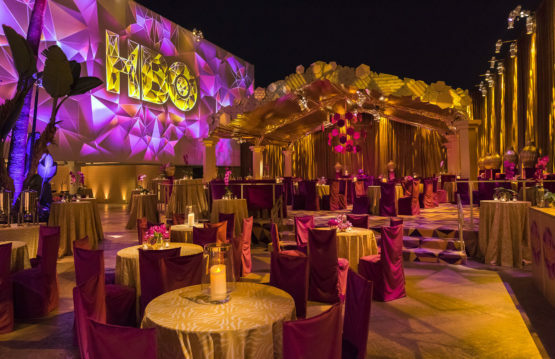 Walls draped in sumptuous gold fabric were bright with uplighting, a textured gobo projected over the entire area added another layer of pure gold to the event, and carefully focused spots on the dining pavilion highlighted an artistic mobile sculpture centerpiece as well as art along the proscenium edge itself. Lending a moving element to the entire design was a wall featuring the video map talents of Bart Kresa. 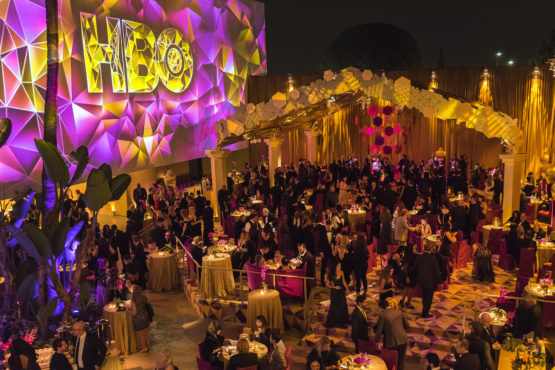 In all, all the elements of the Golden Globes after party added up to a gem of an event! Just like in Hollywood, a great story from beginning to the end! On the outside — literally — film premieres are about the red carpet, the flashing lights, the step-and-repeat and the media. 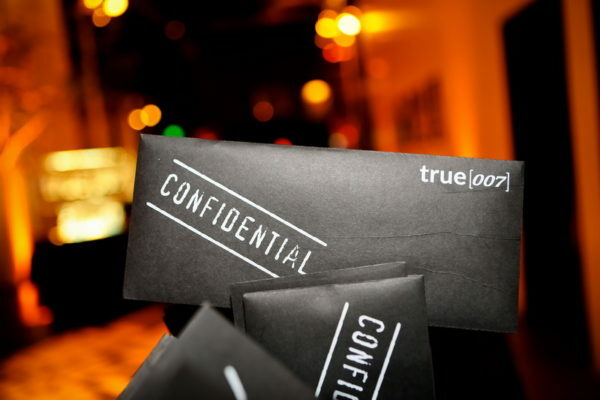 Inside the event, however, the story is very different. The design of a premiere is usually an extension of the film’s artistry and how it made the audience feel. 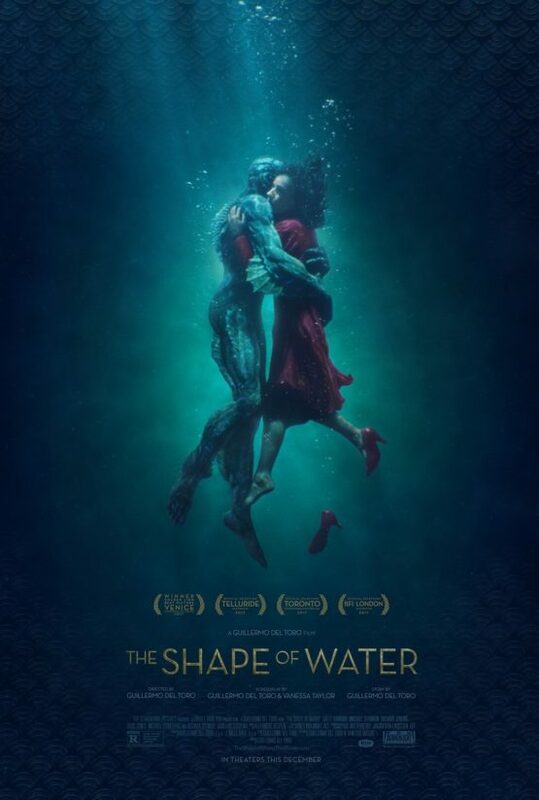 For instance, when Jennifer Wang, founder of JWang Consulting, began to design the look of the Los Angeles premiere for director Guillermo del Toro’s adult fairy-tale, The Shape of Water (which won a Golden Globe for Best Director, Motion Picture, and Best Original Score), she wanted it to be a continuation of the world in which the audience had just stepped out of. “It was important to evoke the feeling of the film,” she said. Immersive experience is the phrase that comes to mind, especially for this story of a watery love affair between an aquatic creature and a lonely mute girl. 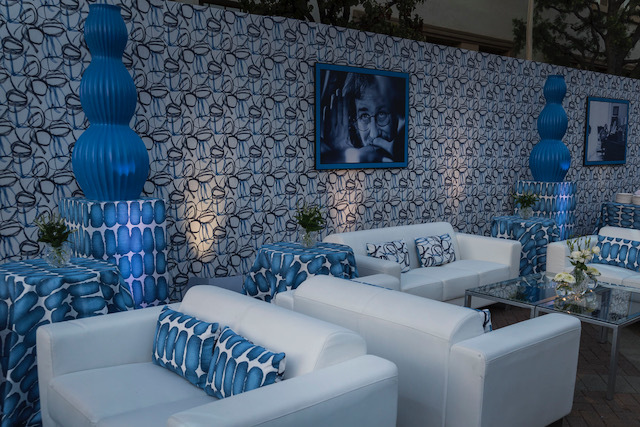 That world began from the very moment guests entered Ocean Prime Beverly Hills, the event space. There, the actual creature’s tank prop from the film was surrounded by watery floor-to-ceiling gobo projections that created a continuous flow of teal blue current. The teal itself was a custom tint that reflected the color palette used in the film and its promotional materials (below). After some trial and error, Blasi found just the right combination to recreate it, and then added purple uplighting on architectural elements to warm up the feeling of the space. The restaurant provided the client enough room for the 500-plus guests, and the several wide open spaces that could work as a canvas for the lighting. However, what it didn’t provide was easy access for the use of a generator. Any possibilities they kicked around always ended up meaning that cables would have to be visible through the space and that would deter from the watery look. Instead, Blasi brought in all LED and ran it on house power. 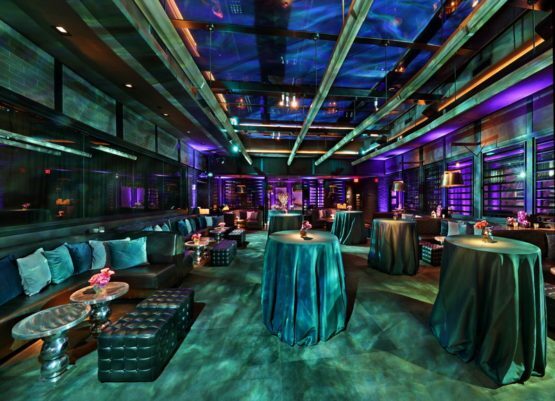 “We brought in tons of glass gobos and rotators to create the movement. There were about 30 throughout the space, and another 80 uplights and pinspots. 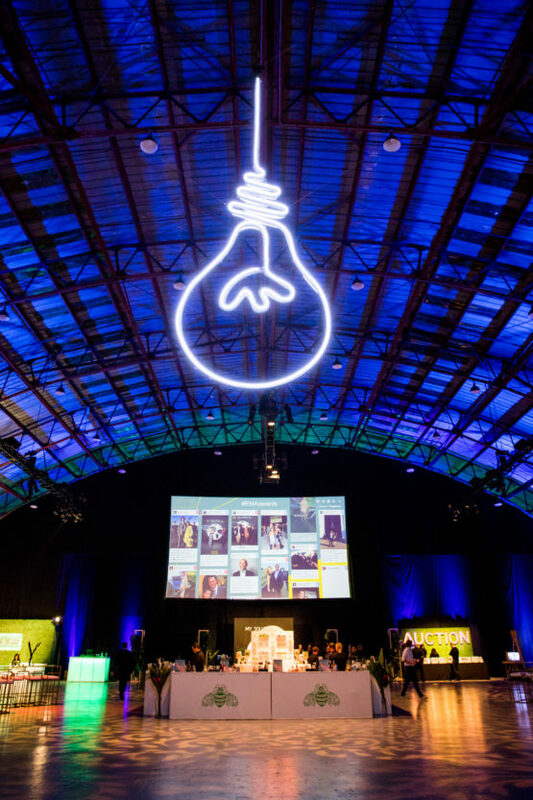 Everything was battery-powered,” Blasi said, adding that while this approach was needed in this case, green solutions like this are the future of lighting. New ways of seeing, changes in preconceived notions … these were not only the result of vinyl decals but also the film’s underlying message. 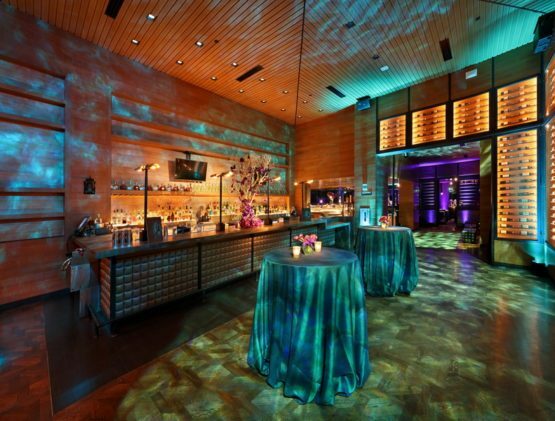 Like water and love, design and lighting are also essential elements with no formal shape until talented event professionals use them to construct the “shape” — a beautiful event space such as this — with them. Fully charged! Fun fact … The charger plates from BBJ Linen (which rents more than linen) appeared to be specially designed for del Toro’s creature and Wang’s design. 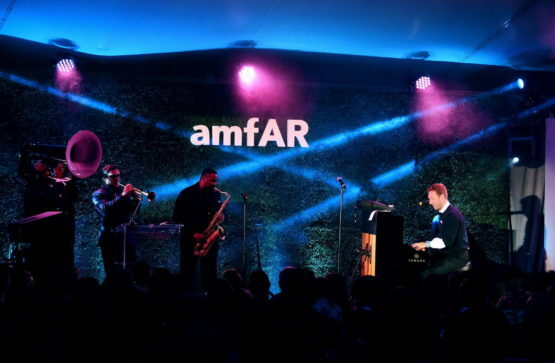 The star light at amFAR this year was shining strong thanks to honoree Julia Roberts. 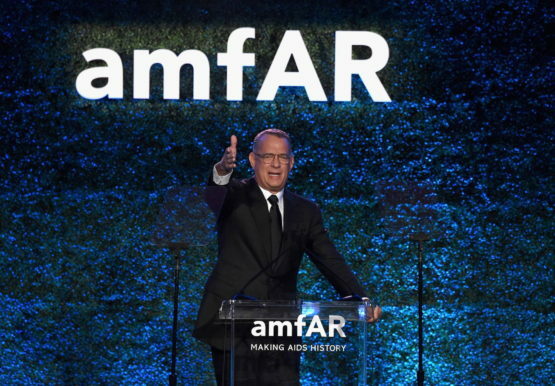 More than $2 million for HIV cure research was raised at the eighth annual amfAR Gala in Los Angeles this month. 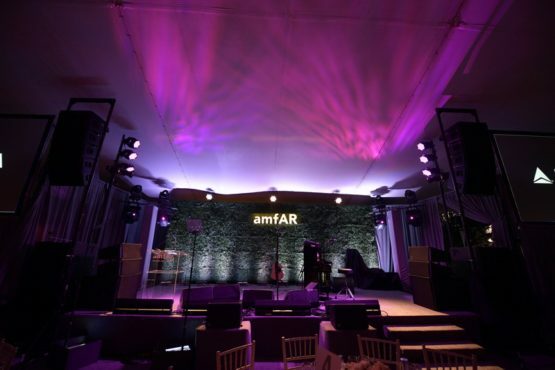 amfAR, The Foundation for AIDS Research, is one of the world’s leading nonprofit organizations dedicated to the support of AIDS research, HIV prevention, treatment education, and advocacy. 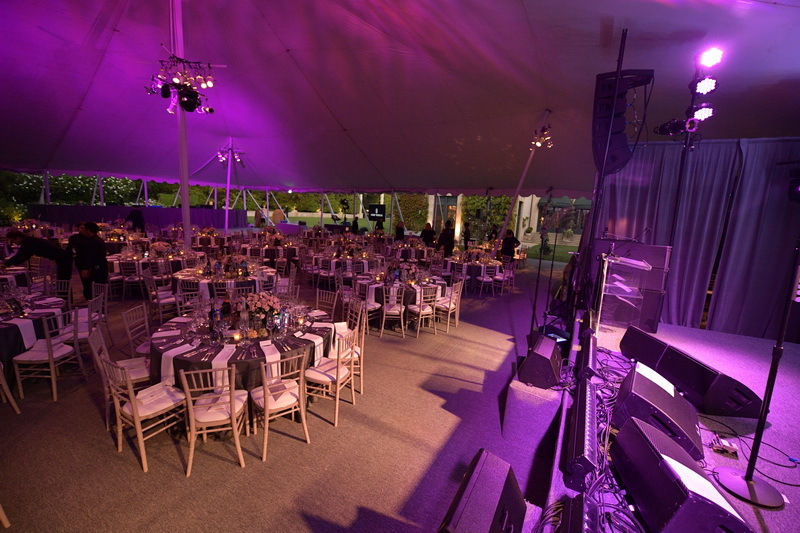 The star-studded event, held in a tent on the upper lawn of Green Acres Estate (also known as the Harold Lloyd Estate), was hosted by James Corden. 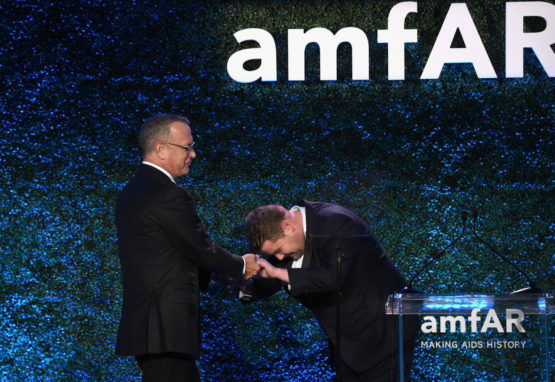 Tom Hanks and many other past amfAR honorees were in attendance to help honor Roberts for her contributions to the fight against AIDS and countless other humanitarian causes. 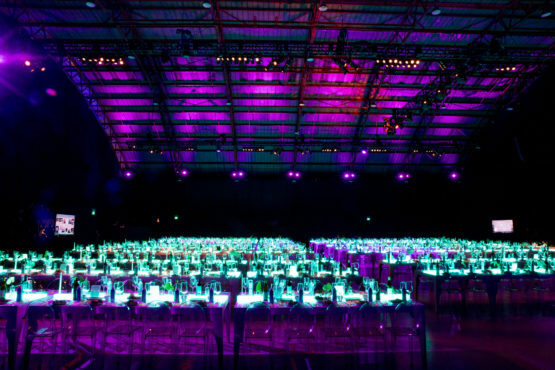 Our team, led by lighting designer Nicolas Blasi, provided a soft texture of light over the dining tables as well as lighting for the stage which included performances by Corden, Fergie and Chris Martin of Coldplay. The stage backdrop was a hedge wall which we accented with uplighting. We also provided all of the portable power and distribution for all vendors. 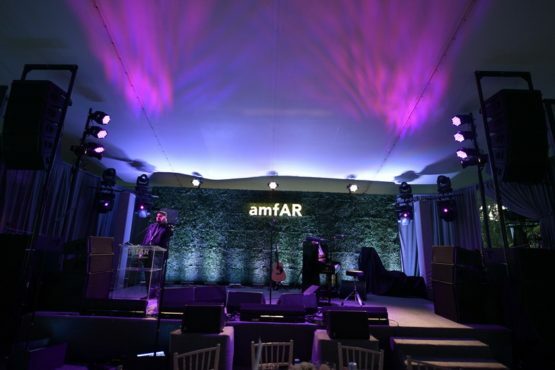 It’s such an honor for us to be part of events as this and organizations such as amFAR doing good in the world! We thank producer DreamVisible for including us in this team with No Static AV and tent and rentals from Town and Country Event Rentals. 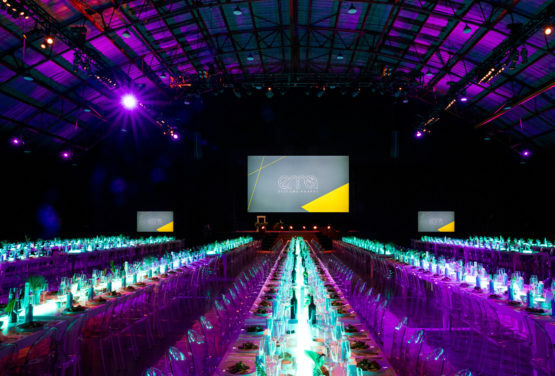 This year the star-studded Environmental Media Association Awards were held at The Barker Hangar and produced by RG Live Events. The massive space was divided in two (really three if you count the “green carpet” arrivals). 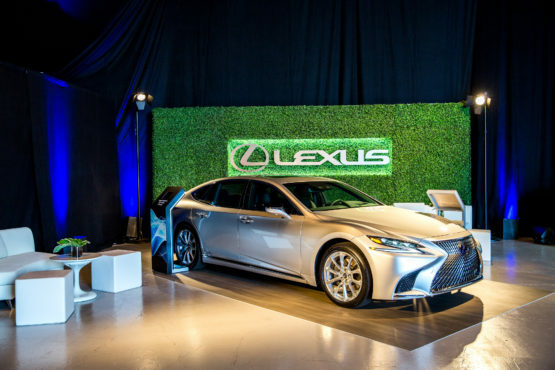 In the first half, guests interacted with sponsors such as Lexus and Clover in a farmer’s market style showcase. 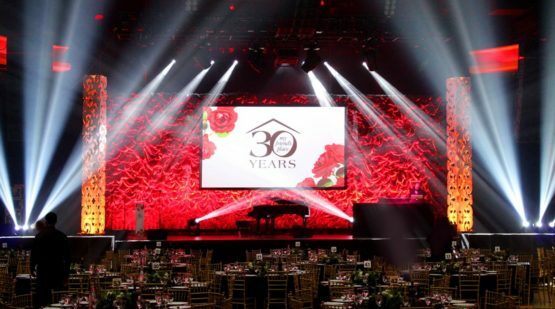 Our lighting designer Lonnie Thompson Thompson oversaw the installation of 400 feet of truss and used LEDs as much as possible for the eco-friendly event. The second half of the evening was a transformation using lighting. 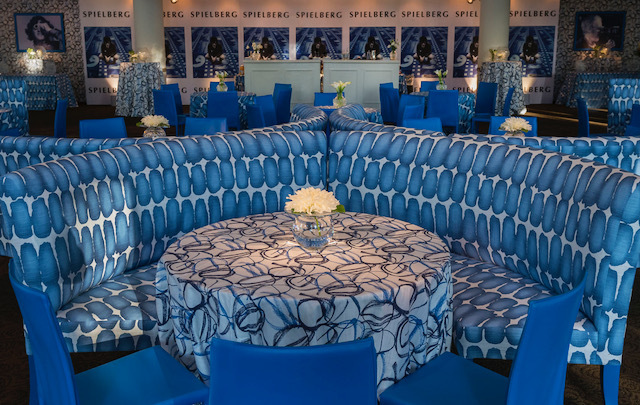 It was a look that not many of the guests had experienced in the space. 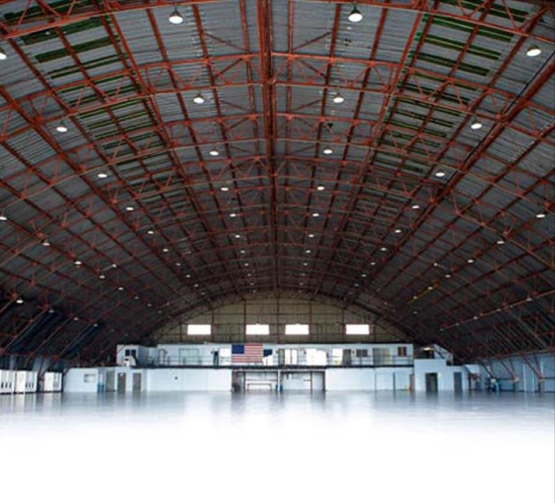 The Barker Hangar is a popular, and large, venue. (See the before and after photos below.) By redesigning the space with lighting, many challenges were resolved of the space and we were able to focus attention on what mattered. The immersive design worked at many levels. 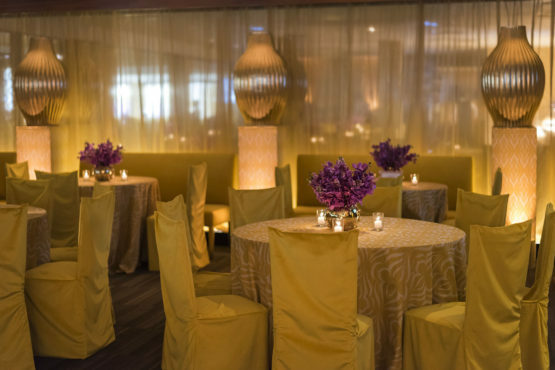 At eye level, specialty lighted tables from Town and Country Event Rentals created total color and light drama. 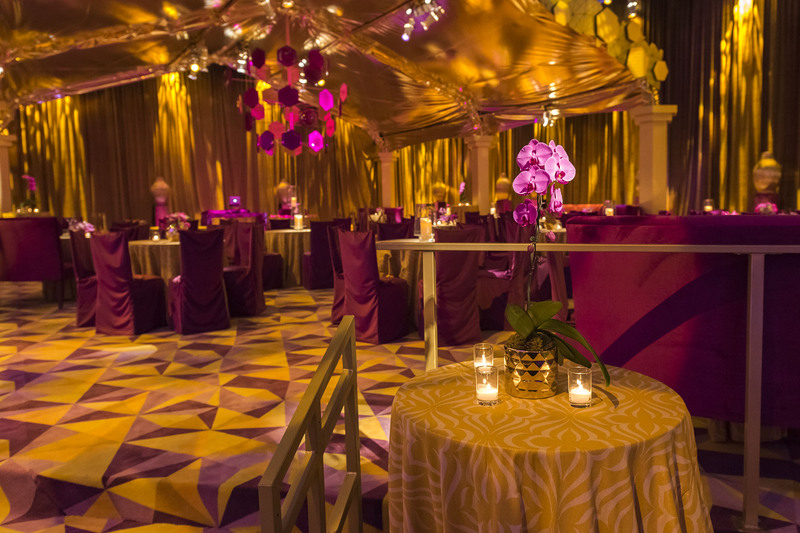 Above the guests, our team painted the hangar’s ceiling in vibrant colors of light. 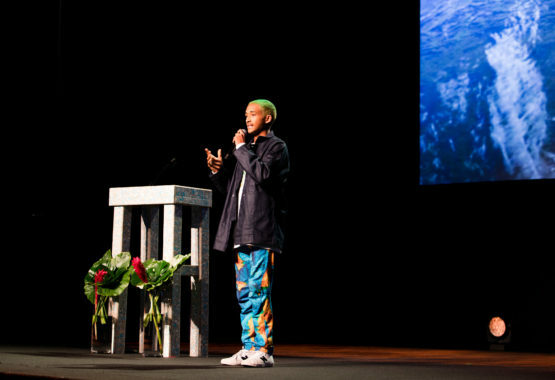 On stage, SenovvA AV produced the lighting and the multi-media presentation and lighting for celebrities such as host Jaden Smith (who dyed his hair green in solidarity with EMA whose hashtag is #green4ema). In Hollywood, life often imitates art. 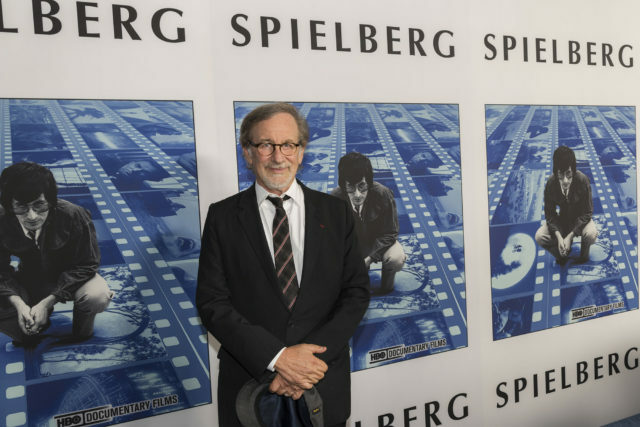 And so it was that HBO’s documentary on the legendary film director, Steven Spielberg, found Spielberg himself on the other side of the camera as the subject of Susan Lacy’s film. 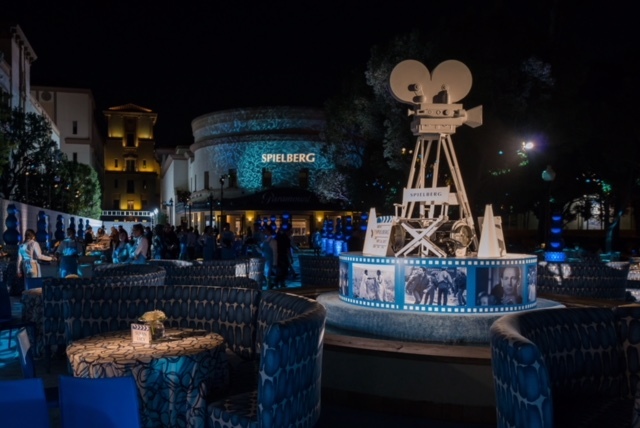 At the opening premiere held at Paramount Studios, the director was the star of the night at an event designed by Billy Butchkavitz. The studio lot was a study in blue for the evening. 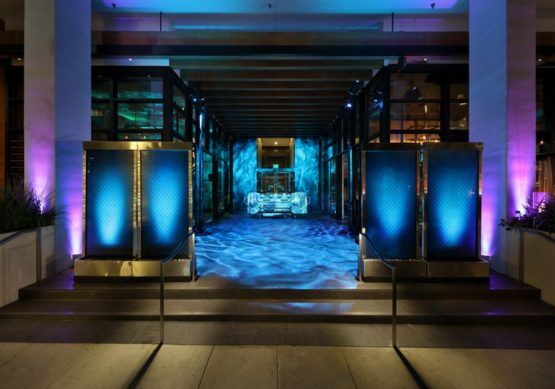 Swirling projections of light added drama to the blue entrance carpet, and the studio facades. 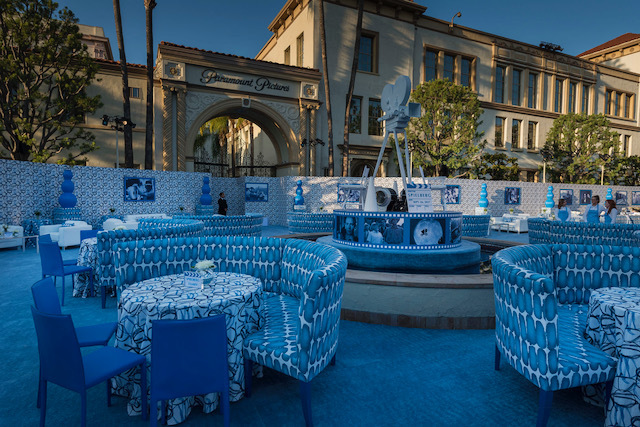 A blue carpeted step and repeat was lighted for the media, and we added table pinspots and highlights on the main decor elements, one of them a larger-than-life vintage film camera and others still shots from his many films.